Video streaming generally consists of two parts, video frames and audio tracks. Both of them are quite significant to express the meaning of video. Aside from characters’ voices, the background music in video is indispensable to enhance atmosphere and depict the mind state of heroes. There’re some moments, however, users may find the audio track is not suitable for the video, or even they want to change video sound with other certain music. For this case, I’d like to share some effective methods to perform this task in the followings. For those people who are suffering from the embarrassing disk space, the online tool would be a good choice to edit media file, because they needn’t to download and install any programs on computer. 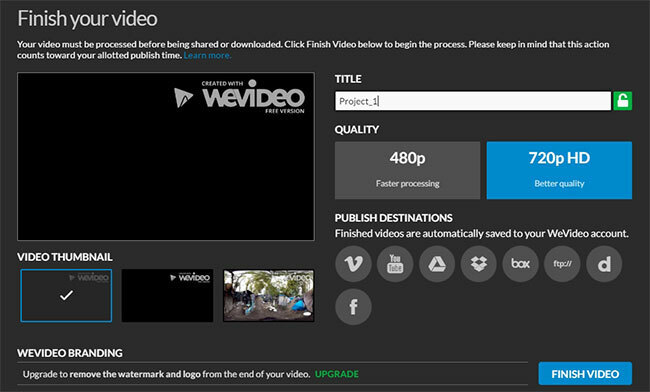 WeVideo is free web-based application that provides great service in editing media files. Upon this online application, there’re multiple editing options available, such as trimming, adding caption, text style, customizing music effect and many more. To learn how to edit audio track with this application, you may follow the steps below. Navigate to the site of WeVideo. Press the button of “Upload media” to add local target media file. Click Plus button to the project to tack and then the button of “Open clip editor”. Adjust the volume based on your preference. Click Music tab and add preferred music effects. Click FINISH button to save your work. Choose preferred quality for the video and then render and publish the project. Hit on the button of “DOWNLOAD VIDEO” to save it to your local disk. Note that, for the trail version, a watermark will be attached on video, which can be removed after upgrading to premium version. If you find the online application is too complicated or troublesome to operate, you may consider trying the desktop video editing programs suggested below. 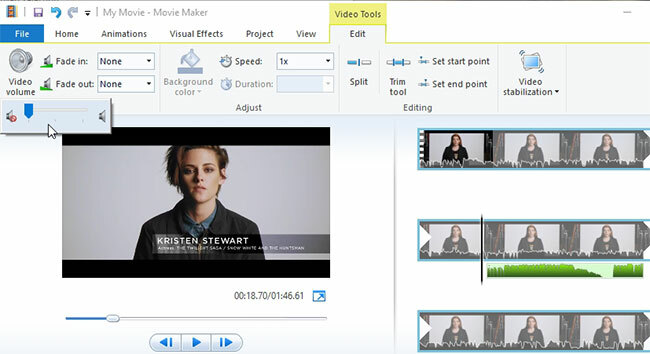 Windows Movie Maker is a simple video editing program developed by Microsoft Ltd, which empowers users to do some basic editing jobs on media files including image, video and music. 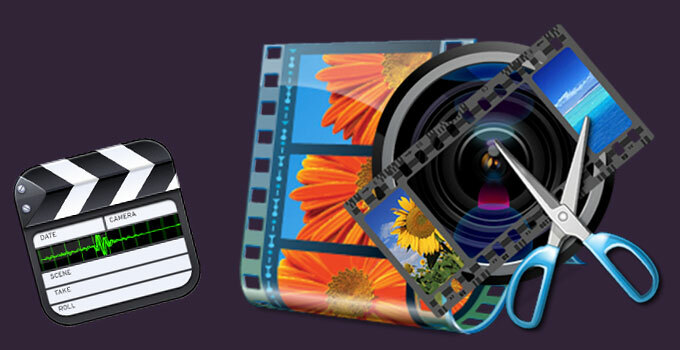 Users can trim, crop video clips, add text and caption as well as customize effects. Since it features a simple interface, users are able to grasp the basic operation steps effortlessly. Refer to below instructions to change video sound with this application. Launch the application and then add your video file. 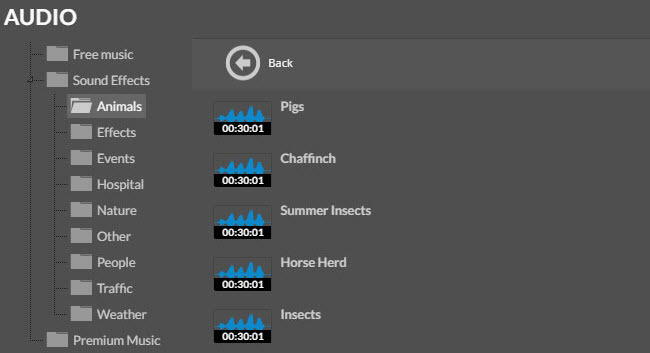 Split the video to select certain section of the video that you wish to edit. Double click the section you have selected and then press “Video Volume” button. Drag a music file into the application to replace the origin sound track. Go to “File” > “Save movie” > “Recommended for this project” to generate your work. This tool is effective to complete simple editing jobs and very easy to use. For more advanced editing functions, the program in next part would be a great alternative. 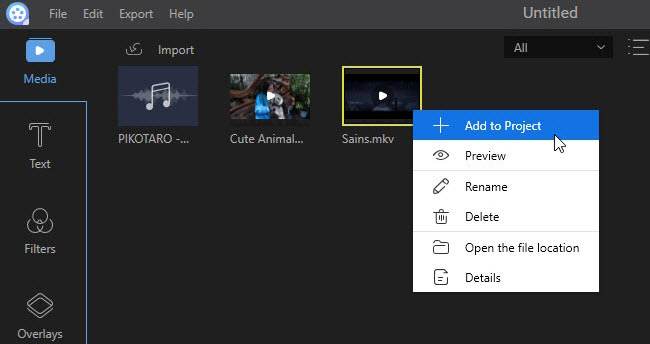 There’s a professional video editing program called ApowerEdit which is designed for users to customize media files (including image, video and audio file) according with their preferences. It provides various practical editing options and enchanting effects, such as transition animation, text, filters, and overlays. Plus, once all editing jobs complete, it supports exporting media file to video, audio file and even devices such as iPhone and Android mobile. Benefiting from the intuitive interface, users can operate this program without any hassles. You may follow the steps below to edit audio track. Launch the program and then add media file into the program. Right click the item and choose “Add to Project”. Split a certain section on video frame and then double click it. Go to “Audio” tab to increase, decrease or mute. Add another music file into the program and then add to project. Adjust the music track to fit the video frames. In addition, this program supports creating VE files that can be edited in further. You can click “File” > “Save as” and then select desired destination folder. All of those methods do an excellent job in editing video sound. The free online application is quite simple. But it falls short in supporting more advanced functions. 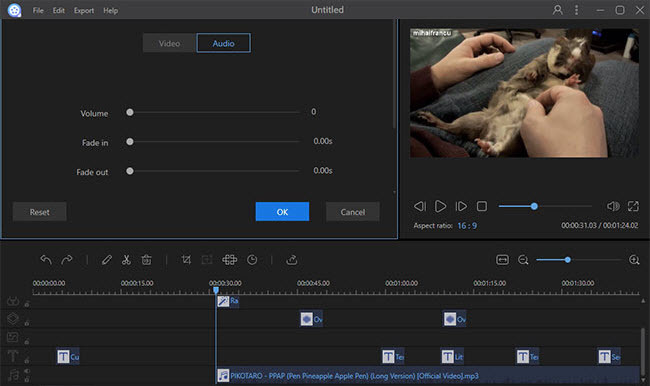 Take an over view on those three methods, it’s recommended to use the last one to edit video sound, which offers more advanced functions and special effects.